Lama Zopa Rinpoche offering a khata to a photo of Lama Yeshe at Losang Dragpa Centre, Malaysia, 2016. Photo by Ven. Roger Kunsang. For those of us who have received teachings directly from Lama Yeshe, he was incomparably kinder than all the buddhas of the three times. He took care of us like babies, not only by giving teachings. Lama was more than a mother, more than a father to us, suffering as he did in everyday life for us. He not only looked after our present life, but our future life also. He led us, helped us make preparation for happiness in this life all the way up to enlightenment. For all of us it is the greatest sadness that Lama has passed away. We have lost our heart jewel, our wish-granting gem. The remarkable aspect that we can see, that we can communicate with, that we can hear advice from: this has gone. I think it must be the greatest sadness not only for us, but for many other people also, Tibetan and Western, who are not his disciples; people who have just talked to Lama, or met him briefly when he was traveling, at different times and different places all over the world. Or for those who have only read Lama’s teachings or just heard his holy words. Even those who never saw Lama but only heard his voice on a tape recorder. 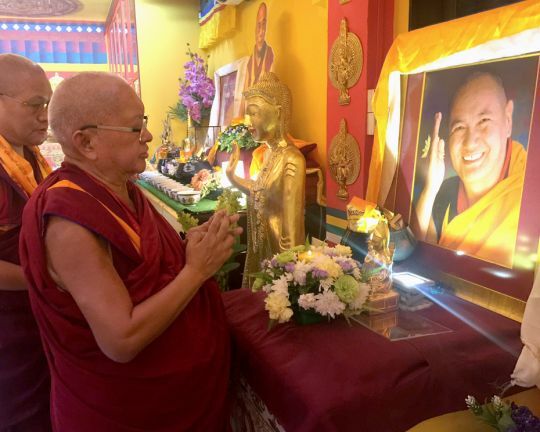 All these people who have felt Lama’s great warmth, his special character, his great loving kindness, his unbearable compassion; I think Lama’s passing must be a great sadness for them, too. Lama had such great will, such incredible dedication to work for others. He planned great projects, for the benefit of others and to spread the teachings. Not only did he have the visualization of all this but he was able to actualize it; he accomplished his plans, ensured that they were done, he didn’t just imagine them. There are many learned lamas and geshe, all bearing the name “holy being” and practicing and teaching Dharma, in the East and in the West. And of them Lama is known to be very special; his actions unbearably compassionate, so excellent. The way Lama gave teachings to Western people especially: so suitable, exactly what was needed, perfect for each individual person.